The keyword here is ‘invest’, long gone are the days where marketing was prohibited, and a brass plaque and reputation alone brought in the work. Then came the age of blindly purchasing adverts in magazines, newspapers, on roundabouts and doctor’s appointment cards. The old saying, ‘“Half the money I spend on advertising is wasted; the trouble is I don't know which half”, by John Wanamaker back in the 1800s just isn’t the case today. With the advent of digital marketing we can now target, track, test and improve all our marketing efforts, leading to greater returns. The result in the last decade has been a gradual decline away from traditional media such as print, TV and radio advertising in favour of trackable and results driven digital marketing. If you aren’t aware of now being able to produce and analyse marketing data, then your thoughts are left way back in Wanamaker’s days. Investing in marketing today is just that, an investment which should be getting your firm a return. If you invest £1 and that produces £2 in return then there is a clear business case to invest more time, money and effort into your marketing activities. The reasons why you should invest in marketing vary and aren’t just down to more work and profit, there are a whole host of other benefits to take into consideration including, helping more clients, taking on more interesting and profitable cases, diversifying and moving into new areas of law, attracting talent and growing the business by creating more jobs. On the whole most firms will want to grow the amount of new cases coming into their firm to provide a comfortable level of profit and growth, so that they can take increased remuneration, help more clients, keep everyone in the firm employed, look after their staff and help them develop their careers. Law firms tend to be set up by an individual or group of lawyers with a following or direct access to clients. Expansion and growth mean recruitment because there are only so many hours in the day and eventually you or your team will hit a plateau. In order to grow the business and reap the rewards, you’ll need to recruit and feel comfortable that there is enough work coming in to sustain the increased overheads. The solution to this dilemma and more is to invest in marketing. Marketing is a group of activities which can help promote and sell your legal services. Don’t think newspapers, flyers and billboards, but think more about targeting individuals who are actively looking for advice, generating enquiries, converting those leads in the most efficient and profitable way and then reinvesting that profit into further marketing. It’s not just about having a website and doing online marketing, in order for it all to be successful there must a cultural shift within your firm. It’s not just something your marketing team or agency does, everyone in your firm is in marketing and they can all play their part in helping to bring in more work. By targeting your advertising to those looking specifically for your services, you can increase leads and therefore new cases. No matter the reason why you want to increase work levels, with today’s targeted marketing you can have a direct impact on the amount of work you are bringing into the firm. Generating ‘hot leads’, which are from individuals and companies looking for advice is the number one way to increase work levels. To make improvements to your profit levels you can focus your marketing strategy on the most profitable areas of work. That way you’ll have more finances to re-invest in marketing, staff wellbeing and on developing the firm. Also, increased profits for the shareholders can lead to increased remuneration. Great marketing helps position your brand in the target market. Your positioning can lead to increased referral sources, as more people know of your services. It can also lead to you being able to charge higher fees, as your brand is seen as a premium service. Some clients prefer the security of a large national firm and others a boutique, niche or local outfit. How you position yourself to your target clients can help bring in the work you want. By investing in marketing, you can develop a following for yourself and your firm. Social media and blogging can let you highlight your expertise and opinions, opening doors to opportunities and referrals which may have otherwise been closed. Being an expert in your field online provides a platform for new work referrals, press commentary, awards, potential collaborations and a whole host of other opportunities. Connecting with other likeminded business professionals and potential clients online allows you to network in an instant, without having to wear out the shoe leather. Nowadays you can invest, test, see the results and then re-invest, which wasn’t achievable 20 years ago. From listening into calls to see who the best converters are, to tracking an enquiry and following up via a CRM system. Marketing data provides a clear pathway to making improvements to the way you handle and convert new cases. If you track your marketing spend then you’ll be able to see the resulting leads, what happened to those enquiries, how many cases were taken on and what the resulting profit on those cases was. You can then improve the system by doing more focussed advertising, improving the speed of respond, changing who handles leads, investing in sales skills to help conversions and adjusting pricing structures to improve profit. If you are looking to grow your firm, then marketing can help bring in the work you need to make a decision to recruit or to top up work levels for a new fee earner. Some junior members of the team may not have a following and so must rely on referrals from senior fee earners and new enquiries. Having a steady income of new leads also helps with developing a cashflow forecast. Referrals can often be sporadic and un-reliable from month to month. Whether you prefer a certain area of law for personal reasons or because of the profit you make on a case, you can market yourself to a range of potential clients. Targeting your marketing efforts can help you achieve those goals of taking on the work you want to have, rather than taking on what just comes in organically. Going after the work that you want, means that you can branch into new areas of work to diversify and protect your firm from any market changes. Marketing your practice doesn’t just mean to clients, you should also be thinking about how your firm looks to potential new recruits. After all, you firm is only as good as the team you have on board. Having the best talent in the firm can lead to more work through the results they achieve for clients and any following they may have. How do potential new recruits know how good it is to work for your firm unless you promote the fact. You may already have a churn of new enquires coming into the business. By investing in marketing and sales skills for your team you can help convert more of those existing enquiries. This will reduce the administrative time spent on leads that don’t convert and can also help filter out enquiries which you don’t take on. If you have promoted the reasons why clients should come to you and you repeat them whilst on the phone, you can help convert the lead. 60% of people looking for a law firm shop around and by marketing the benefits of choosing your firm, you can help stack the odds in your favour. Sales is often thought of as a ‘dirty’ word in law firms, but it really helps in improving conversion rates, saving you from spending more on bringing in leads through advertising. When staff are busy and are confident at converting work and generating clients through their network, then they feel more relaxed in terms of job security. Bringing on more junior staff and developing a culture that rewards marketing and business development can lead to better staff retention. When the time comes, your team may therefore feel more comfortable in wanting to take over the reins, providing you with efficient succession planning. Investing in online SEO can provide a long-term strategy which gets your website up search engine results for various phrases. Once your website ranks for certain keywords, that may then provide you with an income stream of leads without having to pay on-going advertising fees. From online to your offices, no matter how a potential client finds your business, you’ll want them to feel like they already trust in you and your brand. Marketing also includes how your offices look and how your brand is perceived online. Clients are more thorough these days and can find you on social media, see your reviews (both good and bad) and how you respond to them. You’ll want your online branding to be professional and in alignment with the services you provide. Clients are looking for ‘trust signals’ which marketing can sort for you. Clients in need of legal advice are often buying a ‘distress purchase’. By having all your trust signals on show, potential clients feel that they can trust you because of your association with other trusted brands or media outlets, your professionally designed website, transparent reviews, regulatory logos and transparent social media accounts. Investing in marketing should be a part of every law firm strategy. No matter your goals, there will be something that you want to achieve that marketing can help with. In my experience, when marketing is done properly it has provided a return on investment which has enabled me to grow my firm and offering, helping more clients as well as delivering on my personal goals. It has also enabled me to extend opportunities to other up and coming talented solicitors. 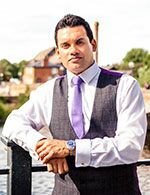 Adam Rasul is the Senior Partner of Holborn Adams Solicitors, a law firm specialising in private criminal defence, regulatory, fraud, legal crisis management and sports law. Holborn Adams are a modern and forward-thinking firm, renowned for their levels of outstanding client service and the results they achieve for their clients. The business has grown substantially over the last few years and attracts a large amount of high quality work. The firm’s bespoke defence practice specialises in representing, business owners, high net worth, high profile and celebrity clients across the UK and abroad. Their client list extends to world champion sports players, footballers, CEOs and entertainers. The team have built an enviable reputation and following for pre-charge advice, legal crisis management and exceptional defence representation. Holborn Adams also boasts a thriving sports law practice and manages well known sports stars professionally both in the UK and overseas. Adam acts for a number of professional sportsmen and women, sports agents and managers, including international footballers and world champion boxers (both in the USA and UK). Much of this work involves international issues and liaison with lawyers and promoters overseas. Adam has taken over 36 international trips since setting up business and on occasion has clients flying into the country on their private jets for advice. The firm has been at the forefront of marketing since Adam opened the firm at just 31 years old. Holborn Adams now has offices in London, Stratford-upon-Avon, New York and Glasgow. We’ve created a dedicated site with our latest news, insights, how-to-guides and of course our Bellwether Reports to help independent law firms excel at the business of law.